Serena is a tennis player. She is still arguably the greatest of all time. But for now, she is a great player who lost a match. By now, you’ve heard: Serena Williams will not make a calendar grand slam this year. Having lost to Italy’s Roberta Vinci in the U.S. Open women’s semi-final, Williams fell just two matches shy of being the first woman since Steffi Graf to win all four major tournaments in one calendar year. In 2015, Williams dominated women’s tennis, losing only three matches to Belinda Bencic, Petra Kvitova, and now the number 43-ranked Vinci on Friday. Media outlets have run amok with news and speculation about Williams. It’s as though she has risen to a status above human, or has become a kind of inkblot on which sports commentators and journalists have interpreted her meaning in the world. She is a symbol of tennis legend among both male and female players. She is a role model for girls and women. She is a success story out of Compton, California. She transcends her age, her injuries, and her criticism. But she is human. And that is what makes her so compelling. Suppose Serena won the U.S. Open final, and the calendar grand slam. She would equal Steffi Graf’s record for most grand slams, and would arguably live up to the Greatest of All Time moniker that has built up around her in the last weeks. Graf is arguably one of the greatest tennis legends the sport has. Yet throughout her dominating years, and after her retirement, little has been written about what Graf meant to tennis, other than being a fantastic player. The 1980s had Martina Navratrilova and Chris Evert, the early 90s had Monica Seles. Each was a tennis prodigy, each elevated the popularity of the sport in the U.S. beyond the John McEnroe and Jimmy Connors era. But they were not symbols, they were tennis players. Perhaps the only woman aside from Serena, and perhaps her sister Venus, to be elevated to symbol status is Billie Jean King, who is a champion not just for women’s tennis but for all women’s sports through her advocacy for the passage of Title IX. Serena Williams’ legacy still has the potential to be superhuman. No one can match her ferocity on court, her power, quickness, and strategy. Until someone did. Does this mean she is no longer the greatest of all time? Hardly. As long as the Williams sisters have had tennis careers, they have been criticized for their very existence in the sport. The two wore beads in their hair. They shouted and grunted. Their coach (and father) was eccentric. And Serena especially displayed human emotion. Which is not uncommon in players. The young McEnroe is a near-parody of angry outburst. Victoria Azarenka has taken out her frustrations on court by destroying racquets. Jelena Jankovic hurled angry words at a chair umpire during a match with Williams herself. Williams has endured media saturation about her body, her romantic life, her loyalty to her family, and her religion. And she does it with grace off-court. But she is not immune to it. Until this year, Williams had boycotted the tournament at Indian Wells after enduring racist jeers from spectators in 2001. She has said in interviews that it has taken years to reject self-criticism about her physique. In a post-match interview after beating her sister in the U.S. Open quarterfinals, Williams candidly responded to a question most women are burdened with: “Why aren’t you smiling?” “It’s 11:30. To be perfectly honest with you, I don’t want to be here. I just want to be in bed right now,” she said. When the Williams sisters began dominating the sport, they were seen as symbols of success for young black girls. When Venus Williams fought for equal pay at Wimbledon, she echoed Billie Jean King’s victory for women in sports. 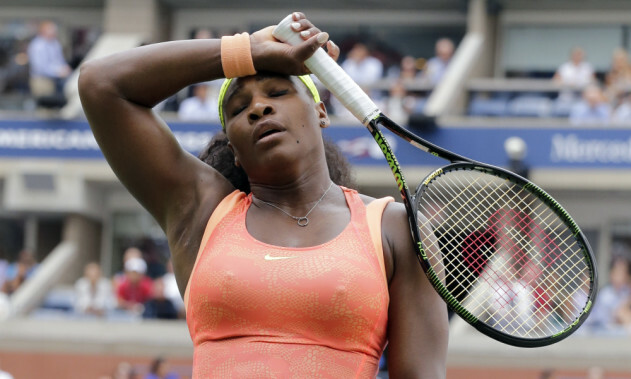 Feminists highlight how often Serena is sexualized rather than celebrated as an athlete. When she was sexualized opposite Maria Sharapova, she became a symbol of racist misogyny, and a tribute to the struggle for intersectional feminism. But she continued to play. And though her ranking fell below the top 150 in 2011, she worked her way back to number one. She is a fighter. A victor. For whatever argument one makes, Williams stands as a symbol. Her loss on Friday brings her back to the level of player. She is human, with good days and bad days. In her post-match interview, she insisted she doesn’t feel pressure on court, and didn’t feel pressure against Vinci. She was simply out-played. The match itself was one for the ages. In the same interview, Williams asked the press to refrain from questions about how disappointed she must have felt. The disappointment was obvious—and would be to anyone. Were she superhuman, the sense of disappointment would be groundbreaking news. But Serena is a tennis player. She is still arguably the greatest of all time. But for now, she is a great player who lost a match. And that is what makes her human.